Ensures optimal temperature and humidity to protect your prized collection. The EuroCave Performance 59 with a custom panel door is a solid door that is built with extra hinges for you to mount a panel of wood that you supply, that would match your surrounding cabinets or to your liking. *Capacity is based off using standard Bordeaux size bottles, using larger size bottles may limit the capacity. If you would like to store larger bottles you can easily adjust the height of any of the shelves. 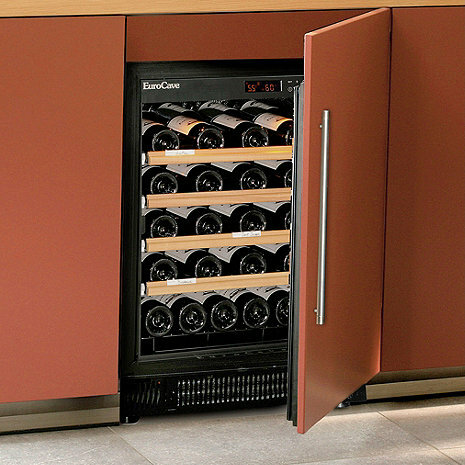 EuroCave Performance 59 1-Temp Wine Cellar, Black Cabinet with a left or right hinged custom door.